Reference number for this case: 31-oct-54-Lezoux. Thank you for including this reference number in any correspondence with me regarding this case. Yssingeaux (A.F.P.). A tradesman of Yssingeaux saw, Sunday evening towards 9 p.m., in the sky, a large ball finished by a tail producing sparks. The machine going down at a vertiginous pace, the observer believed that it was a plane falling in flames. But suddenly, it suspended its race, moved away and disappeared. The phenomenon had lasted from 10 to 15 minutes. This magazine indicates that on October 31, 1954, two inhabitants of Lezoux observed an orangeish crescent slowly moving from the North-West to the North-East. The website indicates that on 31 October 1954 in Lezoux, France, "An unidentified object was sighted, but with appearance and behavior that most likely would have a conventional explanation. One object was observed." An unidentified object was sighted, but with appearance and behavior that most likely would have a conventional explanation. One object, about 1 foot across, was observed by one witness. I found no place called Pezoux in France: the "Pezoux" case is likely the "Lézoux" case. On October 31, 1954 at 08:00 p.m. from Lézoux, the moon was half an hour before setting down, it was at the azimuth 228° 42' and the low height of 3° 40'. It is in its last crescent, 21,3% of its surface is lit, it is in the South-west. The indicated direction does not match, but is it reliable? Nothing tells this - it should all the same be noted that the witnesses are said to be residents of the place, one would consequently think that they should have had the notion of the directions at the place. However, it happened to me several times to see people who were totally mistaken about this... The hour of observation is not given; if it were about 08:00 p.m. to 08:30 p.m. it would match nicely. 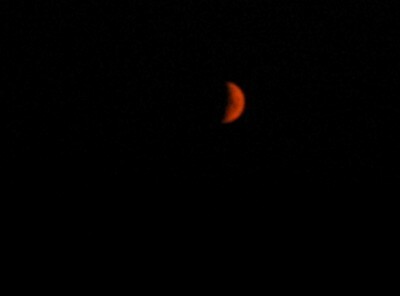 The "orange" color is not the usual color of the Moon. But if it had the usual color, would it have puzzled the observers? Perhaps was precisely this unusual color which prevented them from recognizing the Moon. 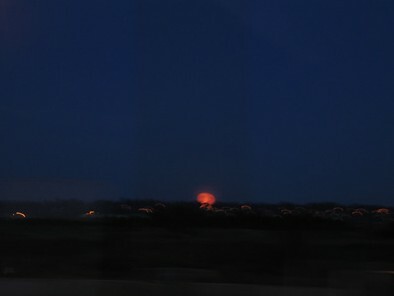 The Moon is exceptionally of orange color, which one call "the red moon". This happens to generally occur in autumn. The observation does not include any particular strangeness as regards the observed "object". 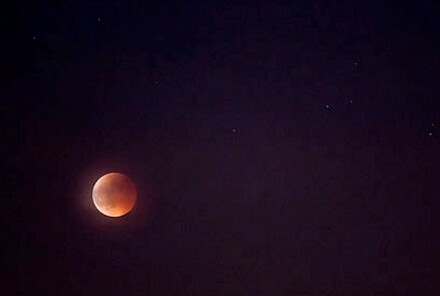 Only the direction of observation would contradict the possibility that it was the red moon. I must note all the same that it seems that there was a meteor that day towards 18:15 or 18:30. See here for more information on this matter. [lp1] Article in the regional newspaper Le Provençal, Marseilles, France, page 9, November 2, 1954. [---] Article in the regional newspaper La Montagne, Clermont-Ferrand, France, November 9, 1954. 1.0 Patrick Gross April 14, 2009 Conversion from HTML to XHTML Strict. First formal version. Additions [ud1]. 1.1 Patrick Gross October 31, 2011 A search on the web and in my documentation did not reveal other sources. Change of "Explanations", which was "Not looked for yet. The moon, to check".